Simple to use speech synthesizer. Is there a better alternative to Funny Reader? Is Funny Reader really the best app in Audio category? Will Funny Reader work good on macOS 10.13.4? Funny Reader will fascinate your family and friends, and make them laugh. 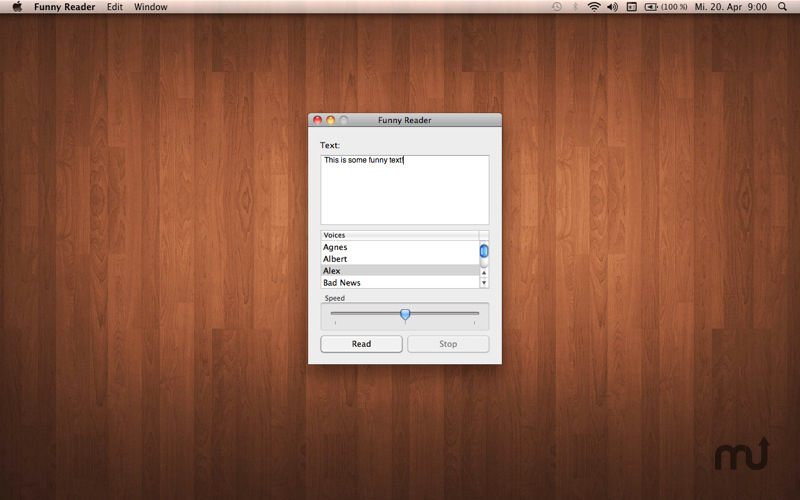 Funny Reader is a simple to use speech synthesizer. Type in any text you want and Funny Reader will read it for you. Choose from more than 20 different voices including Bells, Boing, Bubbles, Deranged, Pipe Organ, Princess and from many different speech rates. Funny Reader needs a review. Be the first to review this app and get the discussion started! Funny Reader needs a rating. Be the first to rate this app and get the discussion started!